Since 1906, the American Association of Law Libraries (AALL) has advanced the understanding of law librarianship and represented the interests of members of the profession. 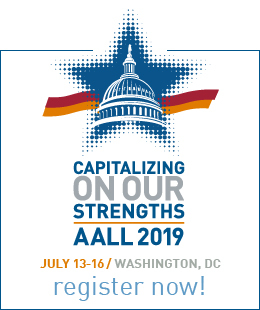 Through its meetings, publications, communities, and professional contacts, AALL has enhanced the reputation of law libraries and provided continuing education for librarians and other information professionals. In 1980, AALL deposited archival materials at the University of Illinois in the hope of preserving a core collection of records, according to professional archival standards, with high research value. Members of AALL, scholars, students, and other researchers, can use AALL’s archive to expand their knowledge of law librarianship and AALL’s role in its development. It is not possible or sensible to attempt to preserve every item produced by AALL. Final versions of materials in print, electronic, and future formats are appropriate for the AALL Archive, as well as objects. Three-dimensional objects shall be captured in a photograph, rather than stored in a box, when necessary or desirable due to size or condition of the object. The AALL Archive Contact, in consultation with the AALL Executive Director, shall make final judgments on specific submissions and their uses, based on this policy and guidelines. Recognizing the volume of materials currently “born digital” and available in no other format, it is important to ensure that these items are transferred to an electronic archive. When possible, items deposited in the archive should be in digital form. Business records of the Association are specifically not included in the Archives Policy, because policies concerning the publication and preservation of business records are dictated by requirements that the Association must meet as a business entity. Financial and other business records considered by the Executive Board are contained in the Association’s Board Books, which already are preserved in the Association’s electronic archive at the University of Illinois. The lists below are general guides, not final lists, of appropriate material. Official records: constitutions and bylaws, minutes, proceedings, and transcripts. Office files: correspondence and memoranda (incoming and outgoing) and subject files concerning projects, activities and functions. Historical files that document policies, decisions, committee and other reports, surveys, including Board Books and other materials produced in conjunction with Executive Board meetings. Publications: one final copy of all programs, journals, monographs, newsletters, brochures, posters and announcements issued by AALL or its subdivisions (e.g., SISs, committees, juries). “Publications” as used here also refers to electronic discussion lists, blogs, and other information in electronic or other formats whose final version can be included in the Archive. Government Relations Office letters, testimony, and briefs. Audio-visuals: photographs as well as audio and video recordings. Unique personal papers of members that relate directly to Association work. The AALL website, AALLNET [Methods for doing this and an appropriate schedule are under review.] Presently, as information is updated on AALLNET, the outdated information is archived and is can be accessed via an advanced search. Records of specific financial and membership transactions. Requests for publications or information after requests have been completed. Blank forms and unused printed or copied materials. All duplicate material: keep only the original and annotated copies. Papers, reports, working papers, and drafts that have been published in final form. Replies to surveys, if the results are recorded and preserved or have been published. Material for the Archive should be in the order in which the creator assembled it. A letter that briefly identifies the material and describes the activity to which it relates should accompany the shipment. After review by the AALL Archive Contact at Headquarters, material found to be suitable shall be sent to the University of Illinois for deposit in the AALL Archive. The following policy governing the use of the AALL Archive is intended to be as liberal as possible, with due consideration given to the needs of scholars, the restrictions imposed by authors, donors, the University of Illinois Archives, or AALL, laws concerning literary property rights, the nature of the materials, and the physical preservation of the documents. Any person may make written application to AALL Headquarters or the University of Illinois Archives for permission to examine, or have examined, materials deposited in the AALL Archive. Subject to restrictions on access imposed by the author, the donor, or AALL, routine permissions ordinarily will be granted at the discretion of the University Archive Liaison. In the absence of the University Archive Liaison, permission will be granted by the University Archivist. If access to material is denied, written appeal may be made to the Executive Board. Completed application forms will be retained by the University Archives in accordance with their policy. Staff of AALL Headquarters and individual members of the AALL Executive Board during their tenure shall be exempt from the permission requirement for consultation and photocopying of material, except material with specific restrictions. Permission is not required for examination of publications (any document reproduced in multiple copies for general distribution) in the AALL Archive. Materials in print or other physical formats in the AALL Archive may be used only at the Law Library or University Archives, depending upon where the particular materials are housed. Archival materials shall not be removed from these areas without specific written permission of the University Archive Liaison or the University Archivist. Users of the AALL Archive are required to conform to regulations governing matters such as handling and note taking that are required by the University Archives. AALL materials in the electronic archive are usually accessible electronically and therefore can be accessed remotely if permission is given. Archival material shall not be copied by any process unless the applicant gives written assurance, by signature on the user application form, that no document or substantial portion of a document will be published or reproduced without the written permission of the writers or their legal representatives and AALL. Permission to copy can usually be obtained upon receipt of such assurance, if copying complies with the fair use provisions of the Copyright Act. For researchers who cannot travel to the University Archives in Champaign-Urbana, copies of documents may be requested from the University Archive Liaison. Reasonable service fees may be assessed, based on policies of the University Archives. The University Archive Liaison or the University Archivist reserves the right to refuse a request if the photocopying or scanning might damage the material, or if the request is so broad as to require unreasonable amounts of staff time. Documents in print should be digitized and added to the electronic archive when a request for access is made. Permission to examine or copy archival material does not convey the right to publish, display, perform, or broadcast (hereafter any or all of these activities are referred to as publish) the material except for publication under the fair use provisions of the Copyright Act. Permission to publish can be secured through joint permission of the AALL Executive Director and the holder of the literary rights, his/her legal representative, or assigns. Permission to publish ordinarily will be granted if written permission for the specific use is secured from the copyright holder. If permission is granted to publish the material, the applicant agrees a) to indicate in the published piece that the original is located in the AALL Archive and b) to assume full responsibility for any infringement of copyright or literary rights that may grow out of use or publication of the material. These guidelines apply to print, digitized, and born digital documents, and are made pursuant to the AALL Archives Policy. The recommended format for digital documents is PDF. Only final copies will be eligible for acceptance for placement in the AALL Archive. 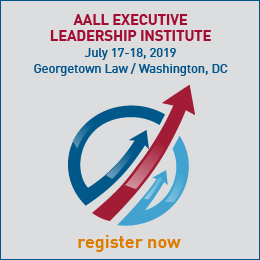 AALL, through the Executive Board Administration Committee, will continue to monitor technological advances to ensure that the most up-to-date, accessible, and practical methods are used. AALL staff, Executive Board members, committee, task force and SIS chairs, are responsible for ensuring that documents with research value related to their work are sent to Headquarters. They should use the general guidelines herein or contact AALL Headquarters to determine what should be sent. AALL will make every effort to follow best practices recommended by the Society of American Archivists (http://www2.archivists.org/standards). Presently, AALLNET information is archived as data is updated. Appropriate Headquarters staff is currently (May 2017) working with new website designers to create a link to the Archive that will be accessible from AALLNET. An appropriate schedule for archiving will be determined by the AALL Director of Information Technology in consultation with the AALL Archive Contact. The sections of AALLNET to be archived in their entirety before being removed from the website should be determined by the AALL Director of Information Technology, in consultation with the AALL Archive Contact.